The following is a detailed explanation of our student registration system. Note that instructions for alumni registration are described on a separate page (view). How Do Students Access MyWorldAbroad? ITEM-1: The School-Email Registration System (SRS) allows students/staff to register using their school e-mail addresses (required). All client schools have access to SRS (view). ITEM-2a: The Quick Access System (QAS) is an additional system that provides direct access to MyWorldAbroad *without* students/staff having to register. QAS is only available to schools that have private portals on their Web site (i.e. pages within this portal are private, protected and only accessible to students/staff). ITEM-2b: The Quick Registration System (QRS) is a sub-system of the QAS: The QRS allows students/staff to quickly register (using any e-mail address) so that they can save their starred items and quiz scores for future use. View. ITEM-3: The Student Prospects System (SPS) and the Alumni Access System (AAS): Both these systems allow schools to preregister students or alumni (one at a time, or in groups) so that they automatically receive an activation email inviting them to register for access to MyWorldAbroad. Two step registration process: STEP ONE: Students fill in our registration form (school e-mail address required). STEP TWO: Student retrieves an activation e-mail, sent from our system. Students are prompted to click on the activation link for unlimited future access to the MyWorldAbroad site. Link to MyWorldAbroad on your school's Web site: We encourage client schools to place multiple links to MyWorldAbroad on relevant pages of the school's Web site. Examples include: the Career Center page (e.g. international resources page), study abroad pages (e.g. volunteer abroad, intern abroad, pre-departure orientation pages), as well as on any other pages where students expect to find international resources (e.g. co-op education, pages related to international study program such as international development, language, international affairs and international engineering programs). Your MyWorldAbroad registration page: This link is easy to remember: www.myworldabroad.com/[your-school-domain-name] (example, www.myworldabroad.com/abccollege). For exact wording to share with students, see the wording on your school's poster and promotional cards, located in the Marketing Products section (see the Student Advisor column in the MyWorld footer). The Quick Access System (QAS) provides direct access to MyWorldAbroad without students/staff having to register. The QAS is only available to schools with private portals on their Web sites (i.e. pages in this portal are private, and only accessible to students/staff). Students like this system: The QAS provides students with the easiest, quickest access to MyWorldAbroad since no registration is required. How is the QAS setup? We provide your IT technician with a confidential link that is then installed as a link on the private pages of your Web site. Marketing the QAS to students: The QAS works best at schools where students have a previous pattern of accessing resources within the school's portal. Two registration systems, SRS & QAS: Schools that use the QAS also continue to have access to the SRS; both systems are available. Schools can choose to promote one system or the other in their marketing efforts. The Quick Registration System (QRS) (view) is a sub-system of the QAS. Why QRS? The QRS allows student/staff to register quickly when accessing MyWorldAbroad with the QAS. It allows them to save their starred items and quiz scores for future access. View. The QRS is easy: The QRS process registration is simple, since students can use any e-mail address (example john@hotmail.com). If a student decides NOT to register with the QRS: Students can still star an item and take a quiz. Their starred items and quiz results are stored in a cookie for future use, but there is no guarantee that this will be accessible over the long term. NEW 2016/06/28: The Student Prospects System (SPS) and the Alumni Access System (AAS) are both great ways to register students or alumni without worrying whether or not they have school-designated email addresses. 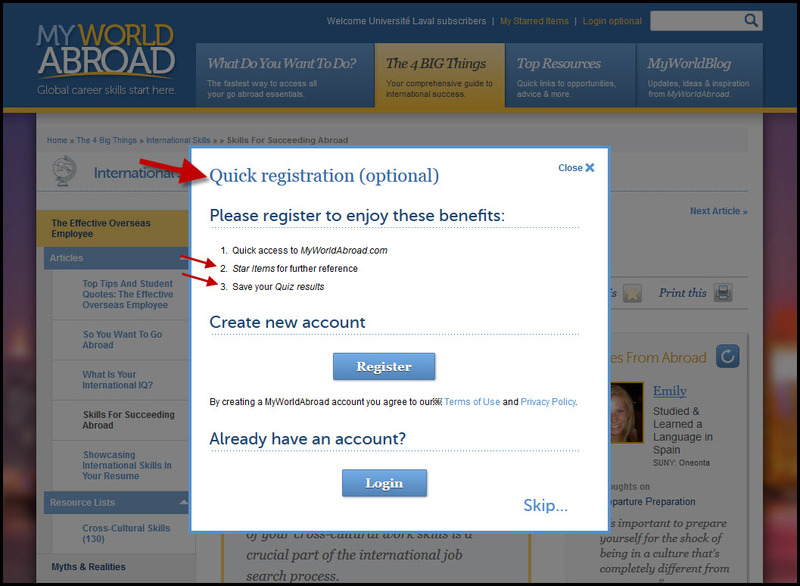 Both of these systems allow schools to preregister students or alumni (one at a time, or in groups) so that they automatically receive an activation email inviting them to register for access to MyWorldAbroad. These users can be registered with any type of email address (for example, a Hotmail or a Gmail account). When registering groups of students or alumni, it is suggested that schools register no more than 1,200 students at a time. The system is generally not designed to preregister all students at a school, if there are many thousands. It could, for instance, be used to preregister all students in a department of 2,500 or 3,000. The Student Prospects System (SPS) is designed to register groups of students: for example, those who are participating in a go abroad program, study abroad alumni, or for students taking a specific course or workshop. All students who have signed up to receive study abroad or career information could also be registered. All these students or alumni will automatically receive The Global Nudge newsletter (12 issues a year), which also contains a MyWorldAbroad login link for students who are already registered and a registration link for those who aren't. Client schools therefore have comprehensive information for measuring student usage for both of our access systems.